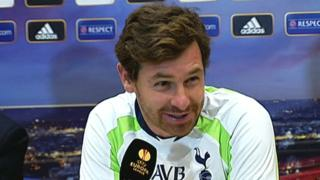 Tottenham manager Andre Villas-Boas says he is "immune" to the criticism that has surfaced over his side's recent performances. Spurs, who were thrashed 6-0 by Manchester City in the Premier League on Sunday, are ninth in the table, eight points behind leaders Arsenal. Speaking ahead of Tottenham's Europa League group game against Tromso, Villas-Boas also says he wants to finish first in Group K by securing three points on Thursday.